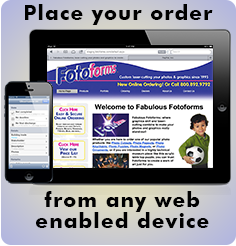 Our process is what makes FotoForms products so much better than our competition. Our Process is What Makes Fotoforms so Much Better! The laser automatically polishes and seals the edges of our products for years of beauty and durability. The laser allows us to easily cut even the smallest interior spaces that a saw can’t reach. The Laser lets us use less distracting, CLEAR acrylic backing instead of colors (a saw leaves a severely scratched edge which is hidden by using colored acrylic). The laser allows us to offer significant quantity discounts because the cut-path can be easily repeated when producing multiples of the same item. We feel that experienced artists give Fotoforms a real advantage in determining how your product should be cut to looks as beautiful as possible. 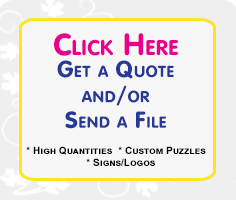 Real artists on staff allow us to offer professional graphics design services if needed. Lamination is very important for long term protection of your photos and provides a level of beauty that makes a real difference. Optional luster lamination is helpful for larger items such as puzzles and lifesize so that flash-glare is minimized if someone wants to take a photo of the item. 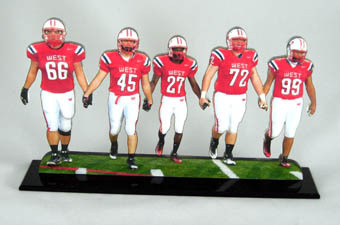 Your photo is covered with a protective laminate and mounted to acrylic. This method gives cut-outs and pop-outs a beautiful surface finish. This method is used to protect your image behind a layer of acrylic. A good choice for signs on public display because of ease of cleaning and protection from vandalism. Sandwich Mounting traps your image between layers of acrylic for ultimate durability. A great choice when the piece will be handled by many people, such as a museum puzzle.